The latest Sony Bravia ad campaign has started in the UK. Following on from the balls in San Francisco and paint on a Scottish estate, the first rabbits TV ad in the UK was shown on Channel 4 on Friday night. An indication of how influential these campaigns have become is the effort that is put in to promoting it. 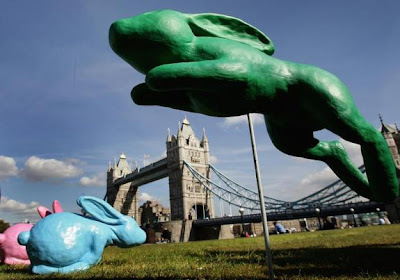 There were ads on TV listings pages in UK newspapers announcing the first showing and this new campaign has also been promoted with model rabbits by Tower Bridge!